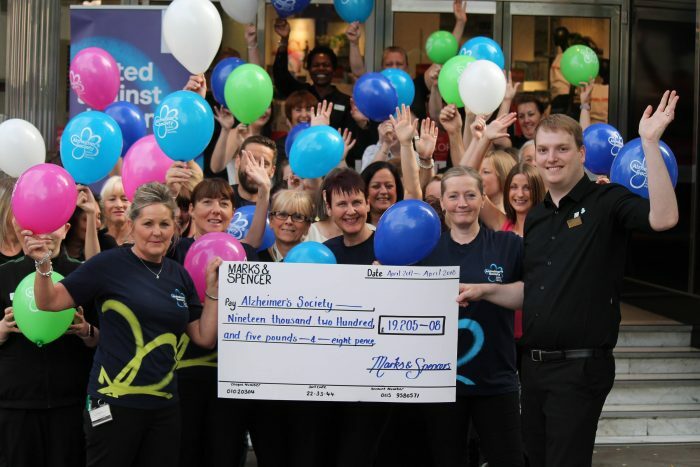 The team at M&S Nottingham has raised over £19,000 for its Charity of the Year, Alzheimer’s Society, through a year-long fundraising campaign that also saw a transformation in the way the store supports shoppers with dementia. On top of the store’s fundraising activities, twenty M&S colleagues took part in the charity’s Dementia Friends Information Session. Dementia Friends is the charity’s biggest ever initiative to change people’s perception of dementia, providing vital insight into how best to help and care for people living with the illness. The session has transformed the way colleagues at M&S Nottingham act, think and talk about the condition. Since it’s delivery, M&S colleagues have become ‘champions’ of dementia, with the store introducing clear signage, dementia friendly mugs with two handles either side for cafe customers, and full-time shopping, packing and paying assistance for those living with or caring for someone with the condition. M&S’s £19,000 donation will help the charity’s efforts to change perceptions about the condition as well as fund vital research and go towards improving care and support for local people living with the condition. Alzheimer’s Society provides services across the country, ranging from Dementia Cafes, Singing for the Brain groups, Dementia Support Workers and the National Dementia Helpline. It also campaigns to ensure the rights of people affected by dementia are recognised, and funds research into prevention, treatment and care, as well as helping to understand how to keep the brain healthy.